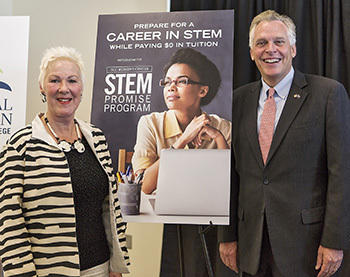 Celebrating TCC’s STEM Promise Program are (from left): Nathalie Molliet-Ribet, Virginia deputy secretary of education for higher education; James Toscano, vice president for institutional advancement; Carol Curtis, president of NOAH Enterprises and a TCC alumna; Gov. Terry McAuliffe; TCC President Edna Baehre-Kolovani; Sharon Morrisey, vice chancellor for academics and research for Virginia’s Community Colleges; and Mike King, chair of TCC’s Educational Foundation. Tidewater Community College’s Educational Foundation announced today that it has established a program designed to boost the number of women and minorities graduating with degrees in science, technology, engineering and mathematics (STEM). The TCC Women’s Center STEM Promise Program, a philanthropic effort, will start with the 2017-18 academic year. The foundation’s initial investment will cover 100 percent of tuition and fees for 30 high-performing students. Gov. Terry McAuliffe attended the announcement today on TCC’s Norfolk Campus. Other dignitaries in attendance included Virginia Secretary of Commerce Todd Haymore; Nathalie Molliet-Ribet, Virginia’s deputy secretary of education for higher ed; and Vice Chancellor Sharon Morrisey of the Virginia Community College System. TCC President Edna V. Baehre-Kolovani said earlier, “We have come to associate the word ‘promise’ with free college education because of such programs as the Tennessee Promise. President Kolovani noted that TCC listens to employers’ needs and responds with the academic programs and training they need to build their workforce. The new scholarship program is named for the TCC Women’s Center because its initial funding is from a bequest in 2011 from the estate of Alexsandria Manrov of Norfolk in honor of her late daughter, Dr. Alexsandria Manrov. Dr. Manrov, who taught science at TCC for many years, died in 1997 at the age of 54. “Alex considered TCC her family, and her mother wanted to honor that and make sure some young women would be able to benefit from her estate,” John Thomas, a long-time family friend, said at the time. Since then, the college has annually awarded Manrov Scholarships for women in STEM. The critical need for diversity in the STEM workforce drove the college to expand the pipeline of STEM students. “Tech industries say they need a diverse workforce, yet 84 percent of the science and engineering workforce is white or Asian male,” President Kolovani said. She noted, however, that anyone may apply for the program. The TCC Women’s Center STEM Promise Scholarship will pay the full cost of tuition for up to four semesters. place into College Composition (English 111) and College Algebra (Math 158) or higher. The degrees transfer to many programs at four-year institutions. Transfer students may be eligible for the Two-Year Transfer Grant from Virginia’s Community Colleges, which provides up to $3,000 a year for STEM students who transfer to particular Virginia public universities. Scholarship applications for 2017-18 close June 15. For more information, visit www.tcc.edu/STEMpromise, or contact the TCC Enrollment Team at 757-822-1111 or enroll@tcc.edu. Those interested in donating to support the program should contact James Toscano, executive director of the TCC Educational Foundation, at 757-822-1015 or jtoscano@tcc.edu.